There were 99 girls (16 and under) living in Courtenay Street in 1911. Thirty-four of them were under 5. Seven, aged between 14 and 17 were out at work: 3 dressmakers (or machinists making dresses), one apprentice milliner, one paperbag maker (working at home on piece work), one was a labeller in the local pickle factory and the other is listed as doing ‘housework’ – presumably in her own home as if it was in another’s she would be listed as ‘domestic’. Many families in Courtenay Street lived in very over-crowded conditions and five of these girls lived in one room with the rest of their family – sometimes quite a large number of people – for example the Turneys had six people in just one room. There are several families with nine people in just four rooms and the ‘winner’ of the overcrowding game is the Gaunts at no.47 who had ten people in just four rooms, although the Deane’s at no.96 come close with twelve people in six rooms. These are not numbers of bedrooms but the total number of rooms including kitchen, sitting rooms. Seven year old Evelyn Smith who lived in my one bedroom flat with her father Albert (a Metropolitan Police Constable) and mother Ellen, must have considered herself rather lucky! Three whole rooms for just the three of them! The house was also one of the new ‘modern’ ones recently built by the Duchy of Cornwall with large, light, well proportioned rooms. Change was coming to Courtenay Street, suffragettes were active in the area, the First World War and the Second World War brought change both to the local landscape but also to the social one. Women got the vote. Landlords, like the Duchy, took advantage of bomb damage to continue their improvement of housing. Despite all this in 2017 there are still families in Lambeth living in overcrowded, unsanitary housing, the girls aren’t called Ethel, Maud or Queenie anymore, but they still exist (along with their brothers) and we still need to do more to ensure we don’t revert to the slum conditions of the 19th Century, the workhouse and the paupers’ mass grave. 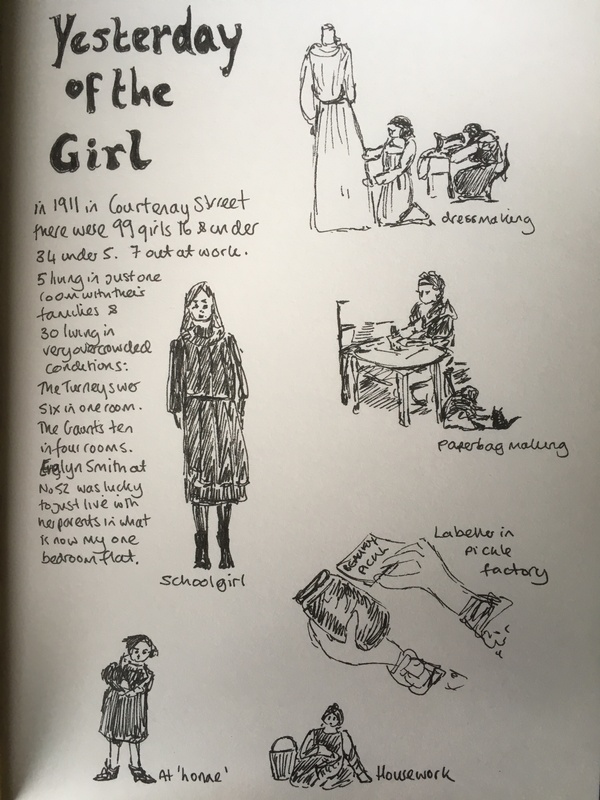 This entry was posted in Artist in Residence, Pick & Choose History of Kennington and tagged inktober, inktober2017, international day of the girl, kennington, Lambeth, overcrowding. Bookmark the permalink.